Investors need to realize that at some point, the highly leveraged Comex gold and silver paper trading exchange will no longer matter. Why, because future physical demand will totally overwhelm the paltry Comex precious metal inventories. This is not a question of �IF�, it�s only a question of �WHEN�. Right now, most mainstream investors still have their eyes glued to CNBC hoping and praying that their and retirement accounts and paper investments don�t get flushed down the toilet. Unfortunately for these investors, man must still abide by the fundamental laws of nature, even though we can cheat the system for many years. After working 33 years, he�s facing a 55% cut to his pension benefits, a blow which he says will �cripple� his family and imperil the livelihood of his two children, one of whom is in the fourth grade and one of whom is just entering high school. Dorsey attended a town hall meeting in Kansas City on Tuesday where retirees turned out for a discussion on �massive� pension cuts proposed by the Central States Pension Fund, which covers 400,000 participants, and which will almost certainly go broke within the next decade. While this is only one small part of the United States, there are many pension plans across the country that are seriously underfunded. Regrettably, it will only get much worse going forward. You see, these investors entrusted their retirements to system run by some of the most corrupt crooks and swindlers on Wall Street. Instead of receiving a hefty monthly check when they retire, they will likely receive very little, if any funds at all. Now, if these investors acquired physical gold and silver over the past 20-25 years, then they would have built up a real store of wealth nest-egg, rather than a PAPER IOU. Fortunately, for some investors�. that is exactly what they have done. 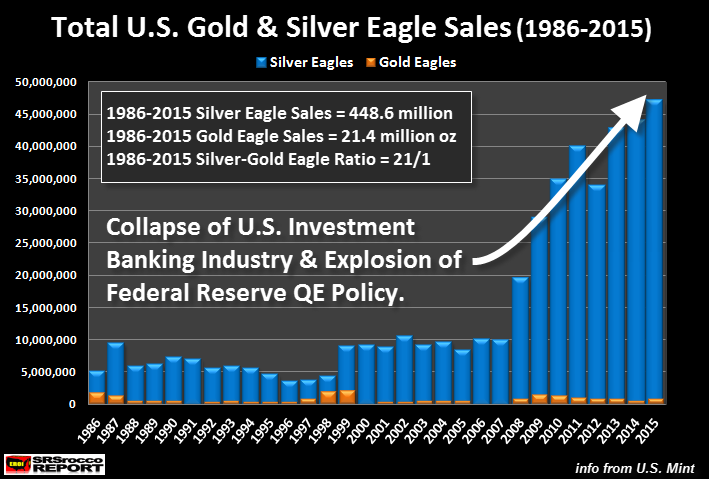 The chart below shows the total U.S. Gold & Silver Eagle sales since 1986. 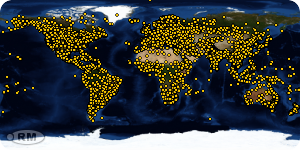 Total Silver Eagle sales to date are 448.6 million while Gold Eagle sales surpassed 21.4 million oz (Moz). Sales of both Gold and (especially) Silver Eagles surged after the collapse of the U.S. Investment Banking Industry in 2008. Sales of Gold Eagles peaked and declined after 2009, whereas Silver Eagle sales continued into record territory reaching 47 Moz in 2015. Now only do we see increased physical gold and silver buying after 2007, but the demand for Silver Eagles continue to increase while Gold Eagle sales declined. Some believe that JP Morgan has been acquiring the majority of Silver Eagle and Maple Leaf sales�. I don�t. It just doesn�t make sense for JP Morgan to purchase high premium Silver Eagles when the bank can acquire 1,000 oz bars for very little over spot. Furthermore, I have had exchanges with many of the precious metals dealers and they tell me that they have conversations with the wholesalers and none of them made any reference to selling large volume orders to JP Morgan. I believe wealthy investors and institutions are buying Silver Eagles, not JP Morgan. Total gold inventories at the Comex are currently 6.8 Moz versus 21.4 Moz of privately held Gold Eagles and silver stocks at the Comex are 153 Moz compared to 448.6 Moz of Silver Eagles. 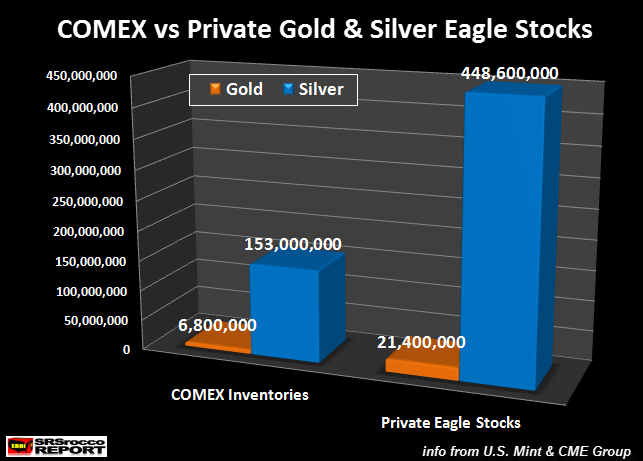 As we can see, private Gold and Silver Eagle stocks surpass total Comex gold and silver inventories by a factor of three. What a difference�.. aye? There are only measly 278,290 oz of gold sitting at the Comex Registered inventories compared to the 21.4 Moz of privately held Gold Eagles. Furthermore, there are only 24.8 Moz of Registered Silver at the Comex versus 448.6 Moz of privately Silver Eagle stocks. Okay� I get it. 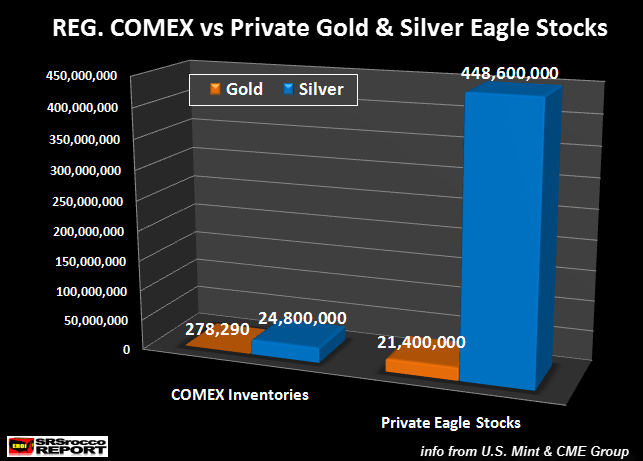 How can I compare Comex inventories to privately held Gold and Silver Eagle stocks? Yes, it�s true, Comex gold and silver are in bar form that meet certain requirements for wholesale trade and investment. 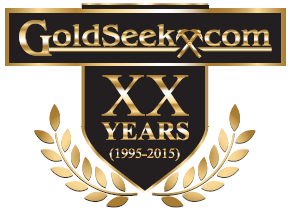 Furthermore, a percentage of Comex gold and silver inventories (mostly Registered) are ready to be settle for delivery into the market whereas private Gold and Silver Eagles do not meet this requirement� unless we consider a certain annual volume of these coins that are resold into the market. � there are some circumstances in which a privately negotiated or ��ex-pit�� trade may be warranted. The term ex-pit trade refers to any transaction that is executed on a noncompetitive basis and outside of a traditional open outcry or electronic trading environment. What Koos is trying to say is that under certain circumstances, Eligible gold stocks can be settled for delivery not just the Registered inventories. The important factor to understand here, is how much of the Eligible Gold would be delivered this way? I would imagine only a small percentage of the total Eligible Gold inventories would be delivered in this fashion. Why? Because the Registered Gold inventories were drawn down first. Moreover I highly doubt wealthy or institutional investors would want to pawn their gold via an �ex-pit trade at a pathetically low price while the future of the financial and economic system are in dire straights. In addition, it is probaly true that not all of the Gold and Silver Eagle sold since 1986 may still be around. However, I believe 95-99% of total Gold and Silver Eagle sales are likely still around, held tightly in the public�s hand. The reason I believe this is due to the fact that Gold or Silver Eagles sold back into the market are not melted for scrap, but rather are resold to new owners. It just doesn�t make sense for a retailer or wholesaler to sell high premium Gold or Silver Eagles as scrap. They make more money reselling them. I decided to take this exercise just to show investors there�s a hack of a lot more physical gold and silver held in private hands via these official coins compared to the pathetically small Registered inventories at the Comex. Lastly, insane trading days like today when the Dow Jones surges nearly 350 points on the worst economic data in four years won�t last forever. Either will Greatest Paper Ponzi Scheme in history.